Group-Study Courses: These 40 courses provide a well-rounded education and balanced approach to get students into the Bible, and for the development of successful Christian living. They are specially designed to be taught in a group setting when combined with the Teacher's Kit. Student Materials - textbooks and workbook average about $26 each. The Teacher's Kit ($45) includes a teacher guide, answer key, student text and workbook. The teacher guide includes lesson overviews, background, and quizzes with quiz answer keys. 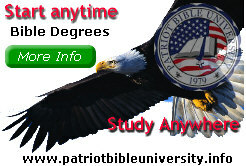 Diploma Program for Individual Home Study through YOUR Bible Institute. 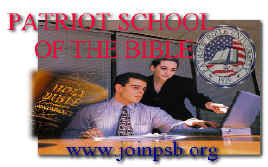 In addition to your Bible Institute courses, Patriot School of the Bible offers hundreds of "home study" courses for those who are interested in pursuing a diploma (or taking specialized courses) in Biblical Studies, Pastoral Studies, Christian Counseling, Evangelism & Missions, Christian Early Childhood Education, Christian Elementary Education, Christian Secondary Education or general Christian Education. Upon successful completion of required number of courses, students will receive a Diploma from your Bible Institute. By completing two courses during each six-week term and if your Bible Institute offers eight terms a year, students will earn the Diploma in Biblical Studies (any 12 courses) in one year and the Advanced Diploma in Biblical Studies (any 24 courses) in two years. (Students may also be given a Course Achievement Award when each course is completed). Course Listings: Students may select from over 100 courses (not the 30 group studies listed above) Visit www.joinPSB.com for course descriptions on these individual home study courses. Bible Institutes receive wholesale pricing. How To Order: Your students place their order with you. Your institute places the order with Bible Institutes by phone 719.657.3330. You will receive the wholesale pricing with the quantity discounts. Answer keys are available for these individual study courses to teachers at $10 each for these non-group studies. They are available only to the listed teacher of the registered Bible Institute.